So it looks like I've got a weekend or two this summer to take my AI out and do some solo kayak camping. We often car camp with our Hobie's but I have yet to kayak camp from it. This isn't really a post to brag about my great trip, or my fantastic plan, because it may not be a great trip, and I probably haven't planned enough, but this trip, and this post should show someone unfamiliar with the Adventure Island exactly how versatile this boat really is. I know it's a long post! I plan to leave my home in Toronto, Ontario, and head about 250 kilometres (155 Miles) to Algonquin Park. 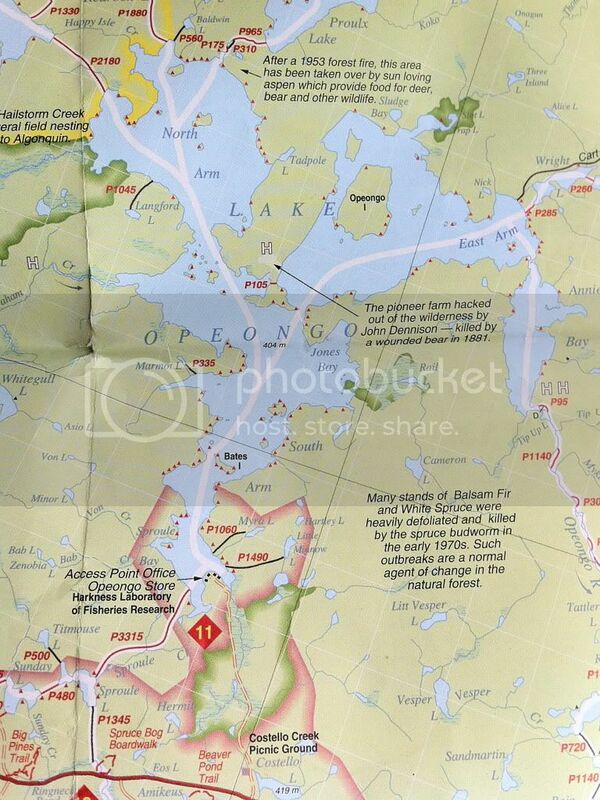 For those of you unfamiliar with Algonquin Park, it's a MASSIVE, mostly wild park. For comparison, it's about 7,653 Square Kilometres (4,755 square miles) or as Wikipedia says, it's about one and a half times the size of the U.S. state of Delaware. It's known as a top destination for canoe trips and backpackers. It has 2,400 lakes, and about 1200 kilometres of rivers (745 miles). It has a number of car camping sites, but the vast majority of campsites in this park are only accessible by canoe, or by foot. It's not a hugely popular kayaking location in Ontario because there are so many portages if you really want to experience the park, but I've planned out one trip that I believe is made for the Adventure Island. The largest lake in Algonquin Park is called Lake Opeongo, and it's a paddlers dream. Here is a picture of the Canoe Routes and campsites. Each tiny red triangle, is a designated campsite. The winds can really get going on this lake, and they predominantly come from the west. I plan to sail from the Access point on the bottom of the map, (notice the large number 11 in red) and make my way up to a campsite in the North Arm. Here is an approximate route that I could take. As you can see, the route would be just over 14 kilometres (8.75 miles) Not at all an impossible trip after driving to the park, registering, driving another bunch of kilometres to the lake, checking in, unloading the boat, and assembling it with my gear for a weekend. But here's where it gets interesting. 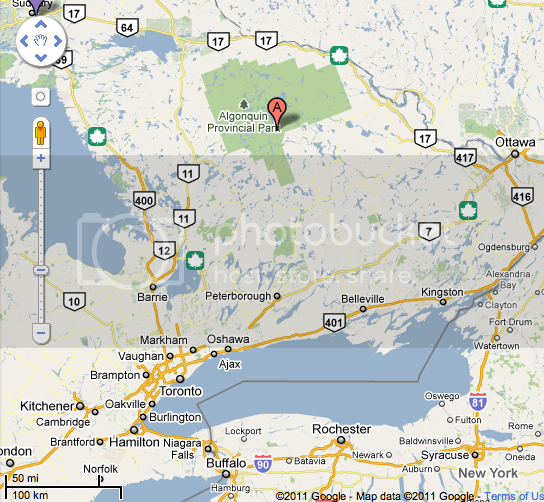 Once arriving at a campsite in the North Arm, I'll be very close to one of the Gems of Algonquin park. It's called Hailstorm Creek. Hailstorm Creek is teeming with wildlife, and it boasts the highest concentration of Moose in Algonquin park. If you visit Hailstorm Creek on a spring morning, you are almost guaranteed to see moose. You can also see all kinds of other wildlife including Beavers. 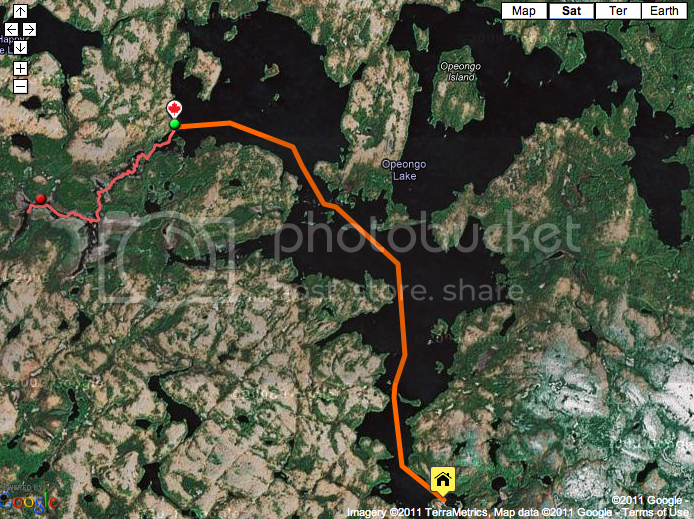 Here is a picture of the route including the Hailstorm Creek Portion. This is where the Adventure Island will really shine. With the AI set up in full sailing mode and the trampolines on, I've got a luggage carrying capacity that no touring kayak could match. I've also got the ability to use the wind, instead of being slowed down by the wind. So I'll be able to enjoy the 14 kilometre trip to my campsite, instead of really having to work for it. Once camp is set up, I can take the Adventure Island apart and strip it down to Adventure mode, (or kayak mode) I'll be able to head out in the morning using the mirage drive and begin down the Hailstorm Creek. I'm excited about that for a couple of reasons as well. I know that Hailstorm Creek is a hangout for Beavers, but I also know that the splashing of kayak paddles usually keeps Beavers at a distance. What I found out last year is that the mirage drive boats don't scare beavers at all. You can get amazingly close to them. The other people camping around us using canoe's and kayaks were amazed at our videos. They almost never saw beavers, and we were able to get up close to them every evening. Here's a video of me kayaking with beavers in another park last year. The best thing about the mirage drive is that in this situation it allows you to keep your hands free to use a camera. I'll need that camera free as I enter Hailstorm Creek on the lookout for those moose! But I'm not done using the versatility of the Adventure Island. Hailstorm Creek is a bit of a river, and a bit of a grassy wetland. Hobie advertises their mirage drive as being able to shed grasses better then a propellor and that's certainly true, but there are occasions where the drive or the mandatory rudder will catch underwater grass, and it loses some of it's efficiency. That's where I'll be able to pull the drive, twist and stow the rudder, and paddle into the grassy sections. As you can see if you have a versatile enough boat, a voyage down Hailstorm Creek can go on for a long time. When I'm done taking pictures on Hailstorm Creek, I still have the entire lake, and it's amazing shoreline to discover. I can sail my way over to Annie Bay on the East Arm, I can circle Islands, there's a week's worth of Adventures to be had on that lake, and I'm really excited to have a boat that fits my style of adventure PERFECTLY! Where my journey will begin - Algonquin Outfitters. Apparently they rent Hobie Mirage boats. I don't know if they rent Adventure Islands or not. A campsite. There is a lot of variety, from sandy beaches, to large rock faces dropping into the water. This is just an example of a more rugged site. A moose in Hailstorm Creek. An open section of Hailstorm Creek. A more grassy section of Hailstorm Creek. Last edited by augaug on Tue Jan 22, 2013 7:39 am, edited 2 times in total. augaug - excellent post in every way. As you say, the planned trip is ideal for our versatile craft and will enable you to have experiences that could only happen on an AI. To me, that's the biggest thing about an Adventure Island. So many people who have never tried it out, see it as a subpar sailing boat, or a really strange kayak. I see it as an amazing boat that can do so much, and that's why I enjoy it. People always talk about how fast it sails, or how weird it looks, but in my mind, it sails fast enough to have a LOT of fun, and it only looks weird because it's purpose built to do so many things well. There's not another boat out there that can do this trip in the way an Adventure Island can. And I can't think of another boat that can do all of that, and still be car topped on an economy car. I'm done with my sales pitch now. You're welcome Hobie! That sounds like a fantastic trip you have in the works! Just a few comments. That photo you've included of the Algonquin Park campsite - I believe the actual campsite is just up beyond the tree and rocky incline and on the flat clearing barely recognizable at the top of the photo. At least that is how sites are typically situated away from the water and sheltered from the wind in the backcountry. Either that or the photo depicts the rockiest and most unlevel backcountry campsite I've ever seen. LOL. 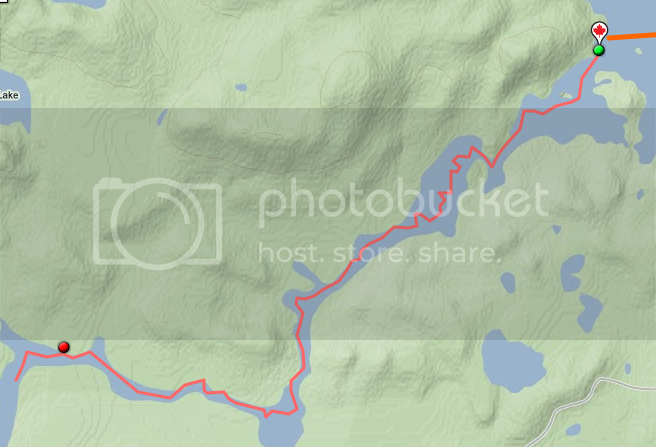 Also, part of my dream of owning two Hobie Adventure kayaks involved doing exactly what you plan to do - go backcountry kayaking in a large wilderness park. However, I was under the impression that the Hobie mirage drive was not permitted in such canoe oriented parks in Ontario because the pedal-drive is considered a "mechanical device" and thus outlawed according to park restrictions. In fact, my local Hobie dealer was setup to do a demo in nearby Quetico Provincial Park (the "Algonquin Park" equivalent of Northwestern Ontario) and management from the park informed him that he would have to leave the mirage drives back at his dealership - the pedal-drive is not allowed to propel the kayaks in the park. When he informed me of this we both thought it was odd, irrational, and completely nonsensical. However, if Algonquin DOES in fact rent Hobie pedal-powered kayaks, perhaps this really is a non-issue afterall, as it should be. Or perhaps they've relaxed the rules. If so, I will be planning my own trip this summer, as I yearn to follow the old Voyageur "highway" through Quetico Park in my Adventure. Could you confirm that the mirage drive is indeed allowed in Algonquin Park? Well my dream became a reality a couple of years ago when I completed an epic backcountry kayak trip with my Adventures to White Otter Castle (not far from Quetico Park). It was a fantastic trip, and one I hope to do again soon. After having completed many similar trips in canoes, I have to say the Adventures were a dream. They are incredibly versatile and made the trip that much more enjoyable. The winds can be infamously strong on the large lakes in this area and there are many stories of even the most hardy and skilled adventurers being stranded - windbound in canoes for days on these lakes. The Adventures easily handled these rough conditions. When canoes were windbound, we were the only ones on the water and still able to make excellent and safe progress through the waves and wind. Here is the link to my trip report below in case you are interested and missed it the first time around in this forum. As can be seen in the photos, we took lots of gear and the Adventures swallowed it all up incredibly well. This trip confirmed to me that they are great backcountry touring and camping kayaks! You might be able to "go to school" on our choice of gear and get some additional ideas for your trip. I can't wait to hear about your experience and see all the photos! The picture of the campsite was actually taken from Google maps, so you could be very correct. I probably captioned that incorrectly. As far as the Mirage Drive in Provincial parks, that REALLY surprises me. I've NEVER heard of that. I've been to Algonquin a number of times, even before we had Mirage Drive kayaks and I've seen Mirage drive boats on all kinds of lakes. I remember seeing a couple of AI's on Pog lake in Algonquin which connects to Lake of Two Rivers, and another large lake, so it hasn't been an issue in Algonquin for as long as I can remember. The video that you see in the post above, and several others like it were shown to the "head" ranger at Killarney Provincial park and he loved the boat. We spent well over a half an hour talking about it, and discussing it's features. I was using that boat on George Lake, which is a Canoe/Kayak lake only. Algonquin Outfitters definitely still rent Mirage drive boats, but only at the Opeongo location. I've always been told that they are only available there, because there isn't a market for them in other lakes because of the difficulty in portaging and the small size of the lakes. We've used the mirage drive boats on a number of lakes in Algonquin, and Killarney, and other provincial parks, and never EVER had an issue. My wife has carpel tunnel syndrome, and can't paddle a traditional paddle kayak, so if we were ever given your excuse up in Quetico, I'd be talking to them about Canadian laws against discrimination towards physical disabilities. I'd be SHOCKED to see any other parks that disallowed these boats, and my experience has been the opposite. They seem to love seeing them out on the water. I haven't looked at the thread involving your trip yet, but I'll be doing that VERY soon. You have the exact words when you mention "go to school", that's what I've been doing for a while now, to learn how to make the trip more enjoyable. One thing that I did buy to help out is the Original Bug Shirt. Ugly as sin, but GREAT when prime moose season is also prime bug season. I'm looking forward to seeing how well it works. Here's their website. They're Canadian also. Here's what the website for Quetico Provincial Park says about "boating"
Motorboats are not permitted on the lakes and waterways of Quetico Park, except in the Lac La Croix and Beaverhouse area. Only the Lac La Croix Guides are permitted to use motorboats, limited to 10 horsepower motors or smaller, a maximum of four per day, and only on 10 lakes. I don't read that as no "mechanical device's" I read that as no "motorboats". Here's the link to the site. Thanks for the detailed response! It was reassuring to read about how well the mirage drive has been received in Algonquin and Killarney. Makes me even more confused at why the folks at Quetico apparently object to it. I don't see it as being anymore of a "mechanical device" than a rudder with an up/down mechanism on a kayak or the reel of a fishing rod! Regarding motorized boats vs. mechanical devices. If you delve deeper into the rules there are specific descriptions of mechanical or mechanized device restrictions throughout the rest of the park. For instance, the following is a link to a discussion of "mechanical devices". 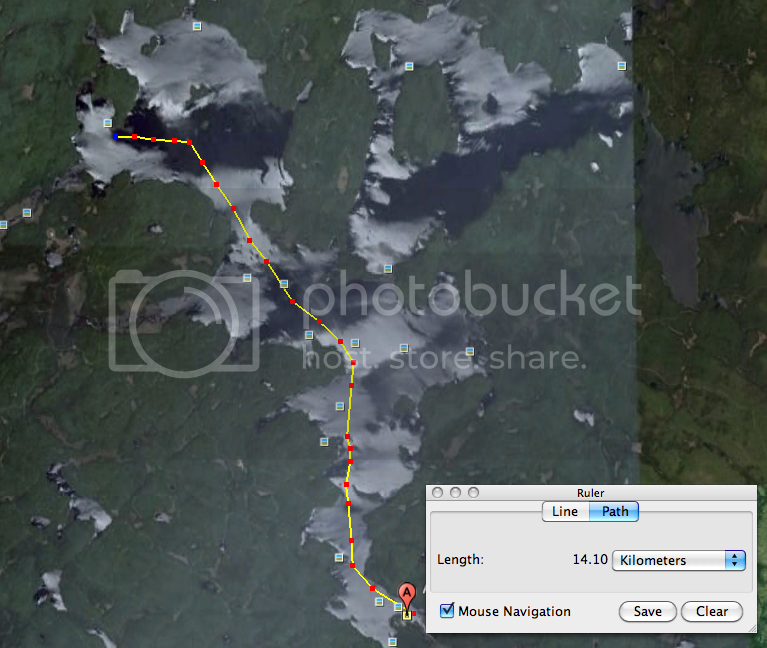 Apparently a sailboat is considered a mechanical device in the Boundary Waters/Quetico Canoe area. If you conduct a Google search for "mechanical device" and "Quetico" you will find lots of discussion. I know that canoe carts are not permitted in Quetico for portaging. Not sure if this is the case for Algonquin. I actually purchased a Spring Creek kayak yoke to portage my Adventure if every the need arose. It actually works quite well and you should consider it if you decide portaging is in your future! I know this is an older post, but as a newbie I am slowly working my way through the forum's history. As we wait for spring to arrive and our first TI adventure, your pictures and story about Algonquin has really upped our spring fever level. In the mid-60's I worked for two summers at Camp Pathfinder on Source Lake in Algonquin Park. I have not been back as shortly afterward we acquired a family cottage on Cranberry Lake in the Adirondacks. We plan on using our new TI there for several weeks each summer. Your pictures 'take' me to both places. Also, thanks for your helpful reply in another forum regarding our transporting the TI. Being both short and old, I think we are going to skip the car topping and get a trailer. By the way, when I worked at Pathfinder it was owned by Roy Thrall and Bill Swift. Bill, I believe, was for many years the owner and perhaps founder of Algonquin Outfitters shown in your pictures. I'm not sure that I ever did a full trip report. Here's a quick video showing a few images that I caught while on that trip. I'm planning this year's trip on my Bravo. I think it will have to include a few less moose! anislandinindy, Sorry that I missed your post earlier. Bill Swift owns Swift Canoe and Kayaks. They have 2 locations outside of Algonquin, and I believe they sell Hobie's. They did a couple of years ago. Bill has been making Swift Canoe's and Kayaks for a long time. They do some really interesting things, including making canoe's and kayaks out of Flax. I don't know a lot about them, but I know they look great, and they claim they are biodegradable. They also have fiberglass, and plastic boats. Great boats for small lakes. I almost bought one years ago, but ended up getting a Delta kayak instead. I found the Delta handled the bigger water of Lake Ontario better, and was just as good on the small lakes. Here's the web address of Swift Canoe. I've emailed them in the past and received emails back from Bill Swift, so I'm sure he's still involved.